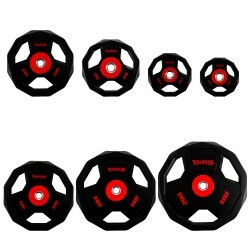 The high-quality weight plates of Sport-Tiedje guarantee a challenging dumbbell/barbell training of highest level. 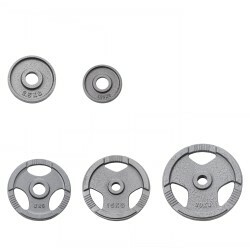 The Sport-Tiedje cast iron weight plates of third generation have a hole of 30.5 mm. The grip holes of the 3G-weight plates allow an easy putting on of them on dumbbell and barbell bars. The Taurus PU weight plate 50 mm pro is a weight plate of superlative: it looks fantastic and is extremely precise. It is encased by very hard-wearing polyurethae making it very durable. 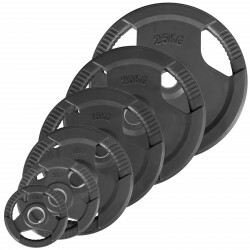 Thanks to grips and rounded stainless steel ring in the middle, the Taurus PU weight plate 50 mm pro is easy to put on. 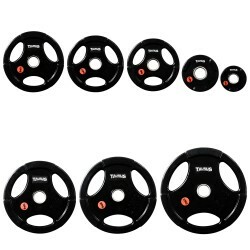 Weight plates with hammertone finish and a 50mm hole. 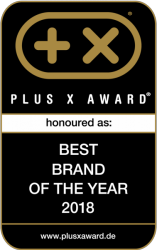 The Taurus PU weight plate 30 mm offers top class feeling ! The weight plate is very precise and looks great. Thanks to the polyurethane casing, it is very hard-wearing and durable. The Taurus PU weight plate 30 mm is easy to put on thanks to handles and the rounded off stainless steel ring in the middle. Don't miss the Taurus Bumper Plate for the workout of the day. The 50-mm weight plates are very resistant and can fall down on the floor without being damaged. Bumper Plates are ideal weights for workouts with quick change of exercises. 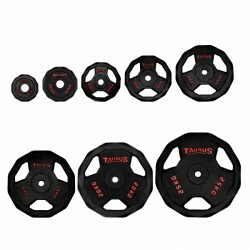 The Taurus weight plate 30 mm Pro 3G is a very robust cast-iron weight plate offering a first-class price-performance ratio. Rubber encased premium weight plates with grip holes! 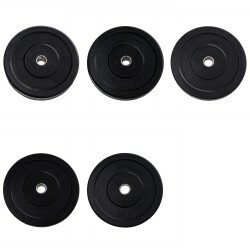 These Sport-Tiedje rubber encased 3G premium weight plates feature grip holes which make picking up the weight plates and putting them on dumbbell or barbell bars easy. I bought these because I was having trouble finding something similar in the UK. The weights are nicely made and have a very nice covering on them that makes them easy to handle. 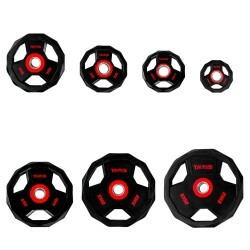 These weights are an excellent addition for anyone with a 30 mm body pump weights bar. I found it very difficult to get 500g weights for this sized bar with 1.25 kg being the smallest weight most commonly. I'm thankful to have eventually found them! I now have greater diversity with regards to the weight I am using after purchasing four 500g plates. I like the fact that they are rubber coated so they aren't cold when you lift them but, like many other weight plates I have used, they are not exactly the weight stated. Three of the plates are around 520g and one is 483g. This is not a deal breaker for me but may be for some. Just what I wanted to add to the Jordan barbell at my Bodypump class. I can now make smaller weight increments instead of trying to increase by 2.5kg. ( 2 x 1.25kg which are the lightest my gym have) I purchased 4 x 0.5kg to enable greater flexibility. They fit the bar snugly so they don't spin around when lifting. Good weight, solid product! No odors, good quality plastic enclosure. I was unsure in the beginning due to the price. But in the end a very good weight. The plastic enclosing is of excellent quality. Does not give off any unpleasant odors. Easy to handle, provides a good grip. Easily slips into the bar. Enclosing seems to be scratch resistant. Weight circle is of a dodecagon shape so although it does not tend to roll, its also not hard to roll if required. Solid product! Highly recommended. Weigth plates are of versatile use. They serve as weight plates for weight training, though can also partially be used independently for strength training exercises. Furthermore, they serve as weight block for certain multi-gyms, if those are ready for taking weight plates. Such multi-gyms are also called "plate loaded". Weight plates are offered by many manufacturers. Besides the multitude of used materials, they are available in different types, sizes, and weights. According to the use, different weight plates are best for different uses. Which material has to be preferred for weight plates? Weight plates of cast iron or steel are the most sturdy ones. For strength training at home, those with rubber coating are recommendable, because they protect the floor and absorb noises. Chrome weight plates are real eye catchers. These visual highlights upgrade your fitness room. We recommend to buy additionally a floor protective mat to protect the chrome layer of the weight plates. 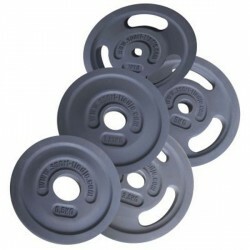 Plastics weight plates are a good choice, when you want to buy affordable weight plates. Though, sturdy plastics weight plates are preferable, because those do not leak when they are damaged. Plastics or PVC weight plates are still rather big due to the used material, so that you can only put few weight plates of higher weights (10-20kg) on a bar. When you often want to change the weight plates and use those independently as training weights, gripper weight plates are the best choice. In addition, these are easier to grasp from the floor, which might be a challenge for other weight plates of higher weights. In general, gripper weight plates have a higher diameter than common cast iron weight plates, affecting your performance during strength training exercises. Which size or which weight is recommended for weight plates? Of course, we cannot tell you how much weight you use for your weight training. Thought we can facilitate the choice, which graduations of the weight you should choose. 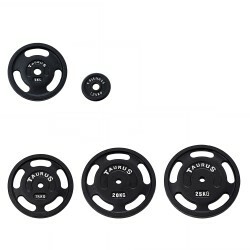 For beginners, who want to by a basic equipment of weight plates, we recommend to purchase smaller weight units, because these are of best versatile use. From 1.25kg to 5kg, weight plates can be ideally used for barbell or dumbbell training. Buying many smaller and middle weight plates is more useful than buying few big ones. Bigger weight units are useful for advanced and ambitious users, because heavier weight plates have a bigger diameter. 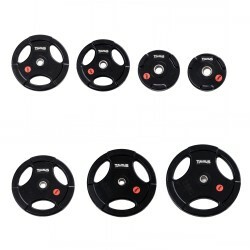 It makes them ideal for all exercises of powerlifting and weight lifting, because the diameter of the weight plates brings the weight to the appropriate height, when it needs to be lifted from the floor. Furthermore, the weight can be loaded with a higher total weight.